Less than a week after it was released, Grand Theft Auto 5 has earned more than $1 billion in sales and reignited the debate about its rampant violence. The news coverage of the game’s more appalling details strikes me — a person whose reaction to the typical video game controller is confusion and boredom — as disturbing. But my bigger question is this: What makes the violence in Grand Theft Auto 5 different from the violence in other works of the imagination? For example, Breaking Bad is a cultural phenomenon which has millions of Americans rooting for a man who cooks meth, manipulates his friends and family, kills adults as well as a child, and is in possession of a machine gun which is likely to figure in the show’s finale. Macbeth is a monument of English literature which draws audiences of refinement and taste to watch the slaughter of kings, friends, innocent women and children, and soldiers while somehow persuading them to suspend judgment of the man who is the agent of all this slaughter. 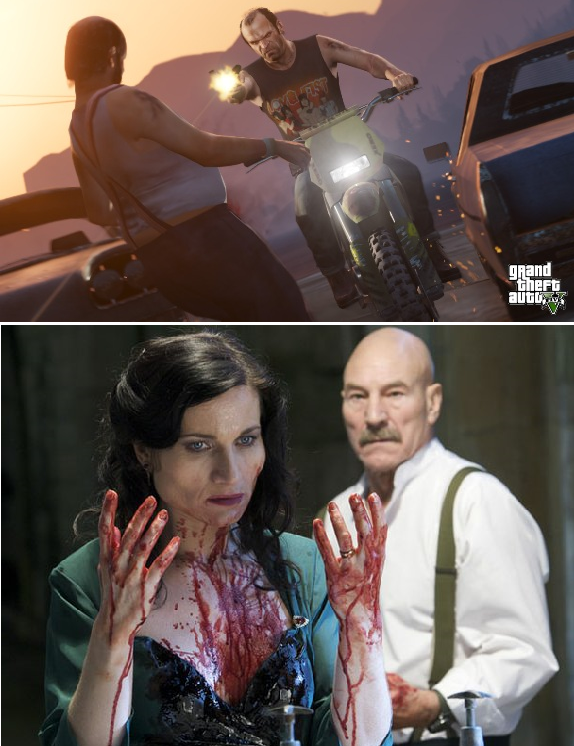 I suppose the great difference among these works, if you can establish the difference, is that Grand Theft Auto 5 celebrates violence for the purposes of entertainment, while Breaking Bad and Macbeth explore the nature of violence to demonstrate its consequences. The point of the video game is to be a criminal and win, or at least escape any consequences for your bad behavior. Macbeth, of course, doesn’t escape consequences in the Scottish play. And we are guessing that Walter White, who already exists in a self-created hell, is likely to suffer more before the show finishes at the end of the month. But I’m not entirely persuaded by this argument I’ve just made. Part of my doubt is that I’m not sure you can demonstrate that the violence in Grand Theft Auto 5 is of a different kind than Shakespeare’s. Defenders of the game claim that it is a satire, which would turn the game into social commentary, although social commentary on the level of Brett Ellis’ American Psycho perhaps. At this point, then, we are required to decide if Grand Theft Auto 5 is a satire done in good faith (ie, “we’re serious about our message”) or bad faith (ie, “we’re pornographers looking to protect our revenue”). And making that judgment is about as slippery a task as a critic could assign himself or herself without helpful emails provided by Edward Snowden. I’m also not persuaded because of this question: Would Grand Theft Auto 5 or Breaking Bad or Macbeth be as popular as they are WITHOUT violence? For example, would you really want to watch a play in which Mr. and Mrs. Macbeth talk about their frustrations with their lives and careers, while playing the polite host to King Duncan and making sure he likes the brie and that his room is comfortable? Not really. The violence is an essential part of Macbeth‘s appeal: appealing, I think, to the dark impulses the human race all feels but which we as social animals need to suppress. These impulses also need an outlet however, and imaginary violence is a much better outlet than actual violence. Grand Theft Auto 5 is a more direct outlet than Macbeth, but this only makes it different in degree. Not different in kind. As someone who has had problems in the past with playing “Civilization IV” late into the night … not a shooter game, but a “build your empire from the dawn of time” game … yes I agree. But another question. A typical pattern for a video game is to play it for about 30 to 40 hours, often in a few long bursts, then set it aside. Coverage of GTA5 noted it does not have versions in the soon to be release game platforms, but this pattern (among other reasons) helps explain why sales are strong. So how is this different from that “book you can’t put down” or that TV show you binge watch on DVD or streaming? Popular entertainments, in particular, want to achieve this addiction-like response. Macbeth seems different, except I’ve read the play at least three or four times and watched or seen several productions. As for Hamlet, as you might remember, I’ve watched 11 different movie versions of the play. Is a writer who earns our re-reading over the course of our lifetimes “addictive” or is she something else? No, at best you are controlling the interpretation of the play, if you are involved in a production. I have to say, though, the times I’ve tried playing one of these video games, I haven’t felt very in control. I can’t figure out which character I am and the next thing I know, one of my sons tells me I’m all out of Mario lives because he’s thrown a turtle at me. Or something. A great post! As a big fan of both Macbeth and many video games in general — I’ve played the GTA series extensively — as well as someone who has taught both at the college level, I find this comparison very interesting (with “Breaking Bad,” too, but I’ll leave that alone for now). Many “sandbox” games, such as the more recent installments of the GTA series, have very similar structures to Jacobean revenge dramas. Violence is often presented as one option of many, and even when violence is the only option in the game storyline, players are faced with a choice as to the way they exercise violence, with a thought to the in-game consequences. Sure, you can conduct a daylight carjacking right in front of a police cruiser, and wind up in a shoot-out with the police — but this actually makes it more difficult to complete the game, and merciful actions (letting an assassination target go, stopping to offer a bystander in need a lift or offering them $100) come back in terms of rewards. Granted, Macbeth (or Hamlet or the Duchess of Malfi or The Revenger’s Tragedy — which makes Macbeth look like a cartoon) isn’t about grabbing a pistol and chasing a loan shark through a series of darkened alleys. But it *is* about greed, ambition, and betrayal, and so are games such as GTA (others, like Red Dead Redemption, focus more on violent cultural contexts and personal honor — also very 17th century!). Revenge is cyclical, and the GTA series increasingly models this, just as Shakespeare and his contemporaries did; you might attempt that carjacking above, but if you’re not quick about it, the victim may pull you right back out of the car and drive off, leaving you on the ground with the police ready to pounce. They may even pull out a gun of their own and fire back. Choose not to let the assassination target live, and his friends / family / gang may remember that when you encounter them in a future mission. I think there’s a tendency for critics to project through the game in many instances — to say, “this is a real human who is acting out personal behaviors or personal fantasies,” rather than to consider that many of these games require players to take on the role of highly scripted and even well-crafted individual characters, who — like the Macbeths — are presented with a series of choices, and must decide how to act, within the confines of their “personalities” as characters. There’s more than a little bit of truth to to the “personal fantasy” angle, of course, but it is also true that many of these games are presenting Macbeth-like stories of greed, ambition, and betrayal; the game is presenting us with a character forced into unusual circumstances, who must either take charge of the situation and act in the best interest of other characters (which leads to in-game rewards such as relationships and extensions of the storyline), or behave selfishly and pay the price (locked out of parts of the storyline, limited abilities / actions, and so on). Macbeth never pretends to be As You Like It, and vice-versa; similarly, GTA never pretends to be Sonic the Hedgehog. The latter examples (AYLI, StH) tell you, by virtue of being comedies / light-hearted, how everything will end; the former examples may tip you off on what is coming, but they offer an experience that is at once terrifying and enthralling along the way. Hi Josh. Your comment is more detailed and well thought out than the post to which it responds! I’m very glad to hear the opinions of someone who has actually played these games (as I admitted I have not). I do like reading reviews of video games, however, and in the back in my mind when I was writing this post — and maybe implicitly in the post itself — was the idea that video games seem to be involving into an art as well as taking on the functions of narrative arts like drama or novels. You might remember from other posts than I’m sorta a reader-response guy: a book is a conversation that the writer begins but the reader finishes. Video games seem like a way to make that conversation bigger, and cede more choices to the player / reader. Readers are asked to imagine themselves into the lives a book’s characters; video games allow people to take that a step further and make some decisions that used to be entirely in the hands of the author. Other random thoughts. With video games, reading the reviews, I’m reminded of the evolution of motion pictures, which started as a technical gimmick, but eventually developed into their own form of art. (The influence of movies on games, and games on movies, is also interesting.) And finally, it seems to me frequently the case that anything the young like can’t POSSIBLY be art, just crass entertainment, until a little time passes, usually about 20 years, that being the amount of time it takes for 20-somethings to become 40-somethings. Add another 20 years to that, and the once-radical becomes the establishment. For example, I’m still shaking my head over “Sir Mick Jagger”. Peter, I should start by saying “thanks” for letting me run all over the place here — it’s a topic that I do enjoy discussing, as you can tell! You raise good points here about the evolution of the medium, which has definitely followed a very specific curve; as young men and women (more all the time) grew up playing games, they imagined what else could be done with them, and set out to accomplish just that. Now some of them have budgets equivalent to motion pictures, but create much richer, more detailed worlds. I recently had the opportunity to test an Oculus Rift system, which is a “for-the-home” virtual reality simulator, and I think that technology is going to be mind-blowing within the next 5-10 years. If Brand survives to become “Sir” doubtless the world will too, then. Great read, the post and all the comments. I don’t know how to play video games but my children were certainly keen on them. I found some of them quite disturbing at times but, as you say, I don’t think they were any worse than some of our literature. I’m very particular about what I let my boys play, and the violent shooter games are out the way some books are; although there aren’t many books I would try to keep out of the hands of my sixteen year old. Naked Lunch is the only thing coming immediately to mind. Josh M had a great comment, didn’t he?